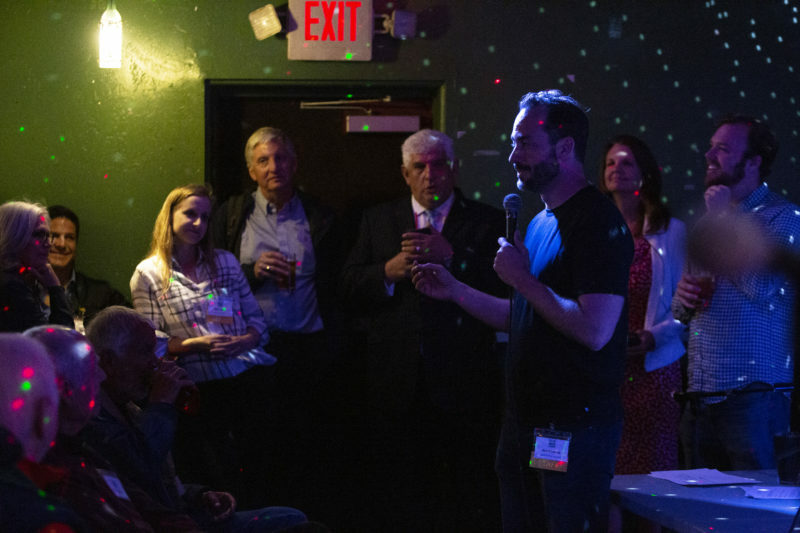 At our live podcast taping at the Whistle Stop Bar, hosts Scott Lewis, Andrew Keatts and Sara Libby were joined by Hasan Ikhrata, the new executive director of SANDAG, and Nicole Capretz of the Climate Action Campaign. A few weeks ago in the Voice of San Diego conference room, the podcast team got together to brainstorm a great program for our upcoming live show. “Who should we get?” Scott Lewis asked. “Hasan Ikhrata?” Andrew Keatts offered. “That’d be crazy,” Lewis said. Lewis, Keatts and Sara Libby were joined by Ikhrata, the new executive director of SANDAG, and Nicole Capretz of the Climate Action Campaign. In addition to playing some games with the audience, such as “Find the Lie — Megaproject Edition” and “Hasan or Elon (Musk): Who Said It?” the team got in to some details on what San Diego’s transit future might look like — even if the hyperloops and driverless cars Ikhrata often mentions don’t materialize. On that front, Ikhrata made a bit of news: He said he believes the current plan for the Purple Line trolley should be scrapped in favor of a route that doesn’t rely as heavily on overlapping with the 805 freeway. “If you want to build transit, build it where people live and work. So you’re going to see in our (SANDAG’s) new vision, a proposed 20-mile tunnel where it should be,” he said. Capretz talked about her hope that San Diegans will become increasingly aware of all the climate-based public policy initiatives that will affect daily life in the region. She said that her group did more than 75 community presentations on the Climate Action Plan, but that far more public awareness about the various climate and transit policies on the table is needed. If you feel left out, don’t fret! We’ll have more VOSD events this year. Keep an eye on voiceofsandiego.org/events. And of course, the full show is below.